One of my favorite types of die cast are those given to me as a gift from others. Patty gave me this for my 50th birthday with a cake formed as pyramid of a dozen Krispy Kreme donuts. Yum!! 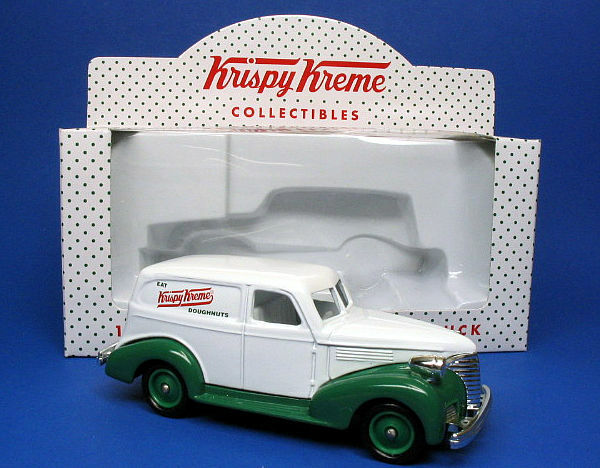 In the early days of the company, our primary business was selling to local groceries and Krispy Kreme® Chevrolet® trucks were often seen zipping around the countryside delivering doughnuts. This die-cast metal, Lledo replica is beautifully crafted and painted to look just like one of our trucks from 1939.